Binary PPIs (new classification of interaction detection methods in BINARY and INDIRECT. Generation of binary interactomes from multiple organisms. New metric only based on experimental evidences. Improved network viewer. [See our latest publication]. Use PubMed ID (PMID) e.g. "16293619"
APID (Agile Protein Interactomes DataServer) is a new full redesigned version of APID (previous resource published in Nucleic Acids Research 2006, 34 Web Server issue: W298-W302) that provides a comprehensive collection of protein interactomes for more than 400 organisms based in the integration of known experimentally validated protein-protein physical interactions (PPIs). Construction of the interactomes is done with a methodological approach to report quality levels and coverage over the proteomes for each organism included. In this way, APID provides interactomes from specific organisms that in 25 cases have more than 500 proteins. As a whole APID includes a comprehensive compendium of 90,379 distinct proteins and 678,441 singular interactions. The analytical and integrative effort done in APID unifies PPIs from primary databases of molecular interactions (BIND, BioGRID, DIP, HPRD, IntAct, MINT) and also from experimentally resolved 3D structures (PDB) where more than two distinct proteins have been identified. In this way, 8,388 structures have been analyzed to find specific protein-protein interactions reported with details of their molecular interfaces. 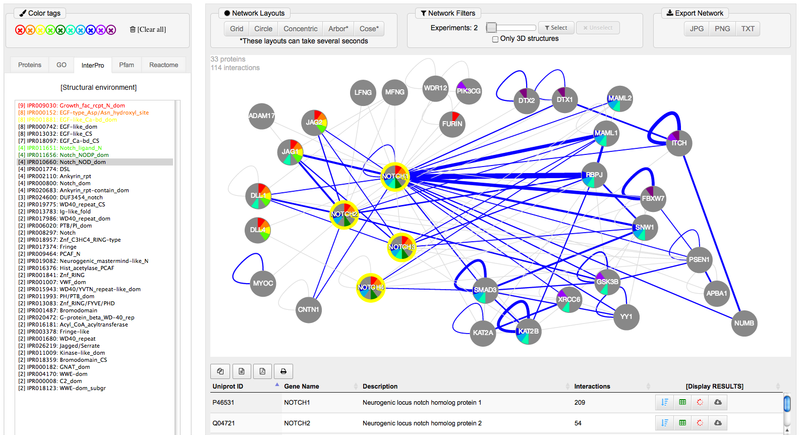 APID also includes a new data visualization web-tool that allows the construction of sub-interactomes using query lists of proteins of interest and the visual exploration of the corresponding networks, including an interactive selection of the properties of the interactions (i.e. the reliability of the "edges" in the network) and an interactive mapping of the functional environment of the proteins (i.e. the functional annotations of the "nodes" in the network). Alonso-López D, Gutiérrez MA, Lopes KP, Prieto C, Santamaria R, De Las Rivas J. APID interactomes: providing proteome-based interactomes with controlled quality for multiple species and derived networks. Nucleic Acids Research 2016; doi: 10.1093/nar/gkw363. 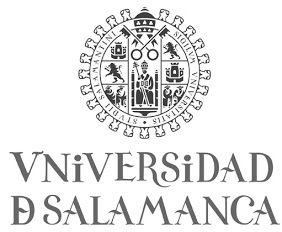 Alonso-López D, Campos-Laborie FJ, Gutiérrez MA, Lambourne L, Calderwood MA, Vidal M, De Las Rivas J. APID database: redefining protein-protein interaction experimental evidences and binary interactomes. Database (Oxford). 2019; doi: 10.1093/database/baz005. Prieto C, De Las Rivas J. APID: Agile Protein Interaction DataAnalyzer. Nucleic Acids Res. 2006, 34(Web Server issue):W298-302. 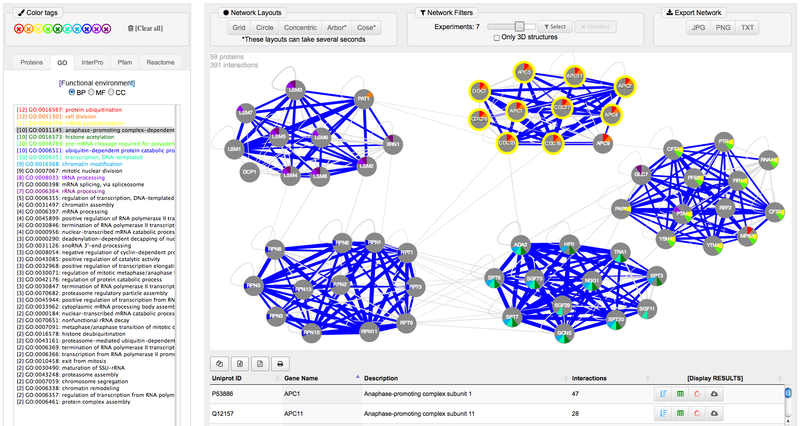 Hernandez-Toro J, Prieto C, De Las Rivas J. APID2NET: unified interactome graphic analyzer. Bioinformatics. 2007 Sep 15;23(18):2495-7. APID Interactomes is licensed under a Creative Commons Attribution-NonCommercial 4.0 International License. Search for the INTERACTOME of E. Coli at a given quality level and download it in your computer as a tabulated text file clicking on [ Get selected INTERACTOME] button. 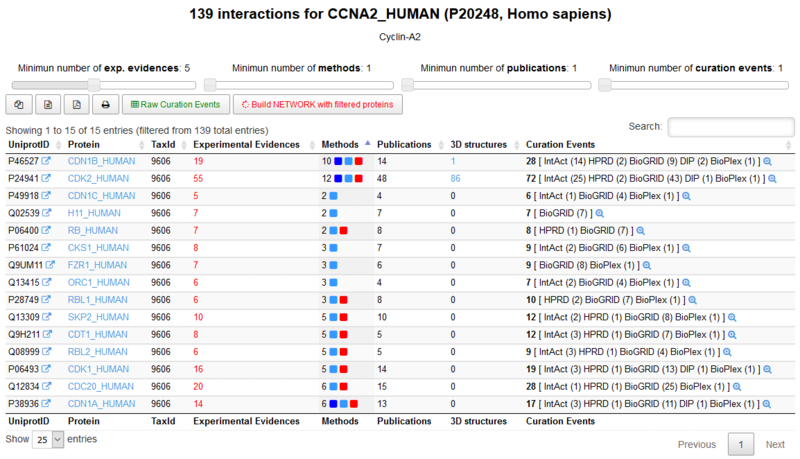 Search for the interactions of a protein (Cyclin A2, CCNA2_HUMAN) using menu [ Search: One protein ]. Once the protein is found, apply some quality filters corresponding to a minimum number of experimental evidences that prove the interactions (e.g. &GreaterEqual;5) and a minimum number of publications that report the interactions (e.g. &GreaterEqual;2). In this way more reliable interactions can be selected. Explore the curation events for each interaction using the magnifying glass icon [ ]. Prepare a list of proteins using Uniprot Name identifiers (e.g. "RASK_HUMAN") or ENTREZ Gene Symbol identifiers (e.g. "KRAS") and place it in the menu [ Search: List of proteins ]. Once all the proteins are found, the list will be presented on a new window, as it is shown below, and all of them can be selected to build a network. 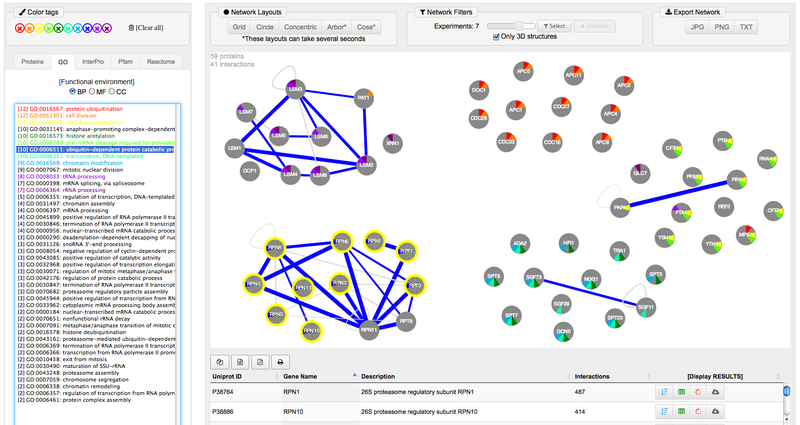 Build a protein interaction NETWORK with the selected proteins and explore it with the new APID network visualization web-tool that allows interactive selection of the properties of the interactions (i.e. the reliability of each edge) and interactive color mapping of the functional environment of the proteins. The view below corresponds to the network build using "List1" (i.e. the first one of the lists of proteins provided as examples at [ Search: List of proteins ]). This list has 33 human proteins that are included in the known human NOTCH signaling pathway (this canonical pathway can be seen at: http://www.genome.jp/kegg-bin/show_pathway?hsa04330). In this example we search with "List2" (second example in the menu [ Search: List of proteins ]). This list includes a collection of 59 proteins from Saccharomyces cerevisiae involved in different nuclear DNA and RNA processes. 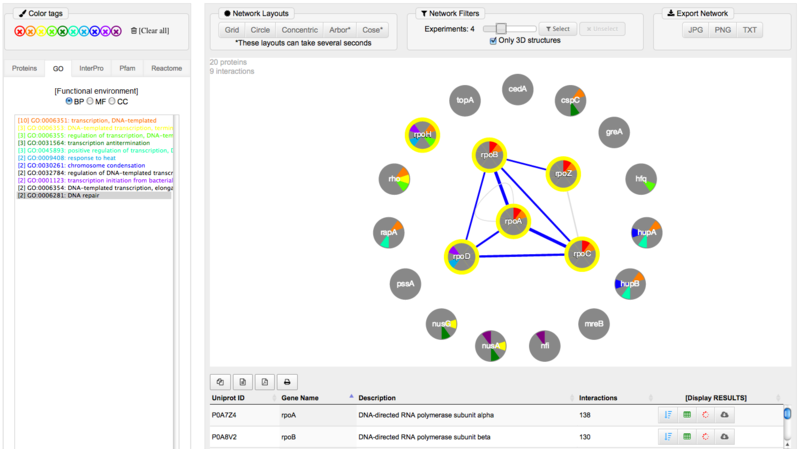 Once selected these proteins, we applied the Build NETWORK menu button and go to the visualization web-tool selecting "Arbor" in "Network layout" and "2 Experiments" in "Network filters". 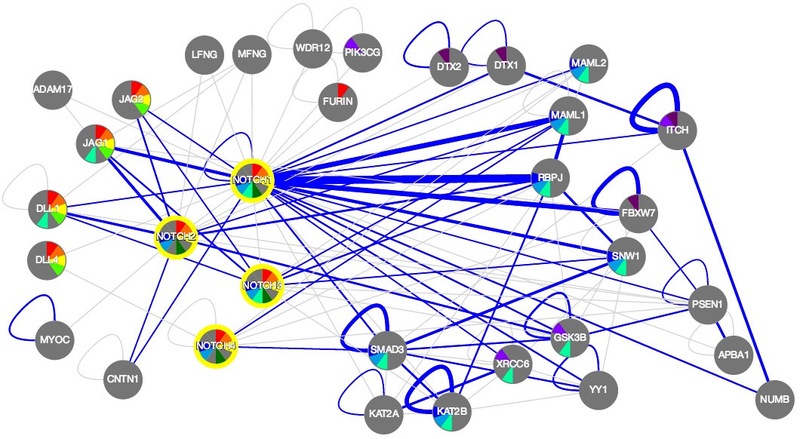 In this way, a network with 59 nodes and 391 edges is showed, revealing the clear presence of 5 distinct protein complexes. The figures show the network also using the selection of functions marked with different colors and, in the panel below, the selection of the just interactions that are proven by 3D structural data. In this example we search with "List3" (third example in the menu [ Search: List of proteins ]). This list includes the Escherichia coli RNA polymerase σ70 holoenzyme, a protein complex composed of 5 subunits that has its 3D structure determined (e.g. PDB: 4JK1, 4JK2), plus other 15 proteins that are known to interact with this complex. The figure below shows the view of such proteins with the selection in blue of just the protein interactions derived from 3D structures. The proteins are colored according to their functional annotations derived from GO BP (Gene Ontology Biological Process). APID server was built with a protein and proteome-centered strategy, using UniProt database (http://www.uniprot.org) as the main guide to identify and handle all the proteins and to map them into the reference proteomes of each species (based on the new proteomes resource that UniProt has recently developed: http://www.uniprot.org/proteomes/). In this way UniProt (including both Swiss-Prot and TrEMBL) was used as the main reference database and we used protein or gene identifier recursive mapping to UniProtKB AC/ID as the key way to integrate and unify data, thus avoiding duplications or incorrect identifications. 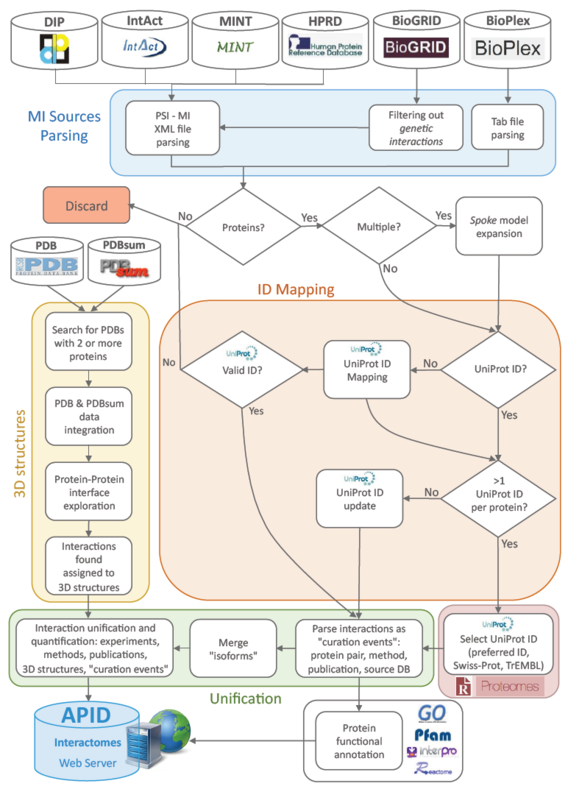 To provide a global view of the methodology and procedures followed to build APID, a graphic scheme (see figure below) presents the main workflow with the pipelines and steps applied to integrate the protein-protein interaction data. The following table shows an update of the statistics about the interactomes for several well known organisms. These data indicate the coverage over the whole proteomes (as reported by UniProt Reference Proteomes, that include both Swiss-Prot reviewed proteins and TrEMBL unreviewed proteins for each organism). The following table shows an update of the statistics about the interactomes for several well known organisms. These data indicate the coverage over the whole proteomes (as reported by UniProt Reference Proteomes, that include both Swiss-Prot reviewed proteins and TrEMBL unreviewed proteins for each organism). In this way, for example, in the case of human (Homo sapiens) the current UniProt Reference Proteome includes only 20,201 reviewed proteins, but we prefer to map to the complete UniProt dataset because many reported experiments are done with proteins included in TrEMBL. The following table shows statistics about some of the largest interactomes included in the new APID. These data indicate a fair coverage over the whole proteomes. In the case of human (Homo sapiens), the number of proteins with reported interactions reaches a 40% of the human proteome. 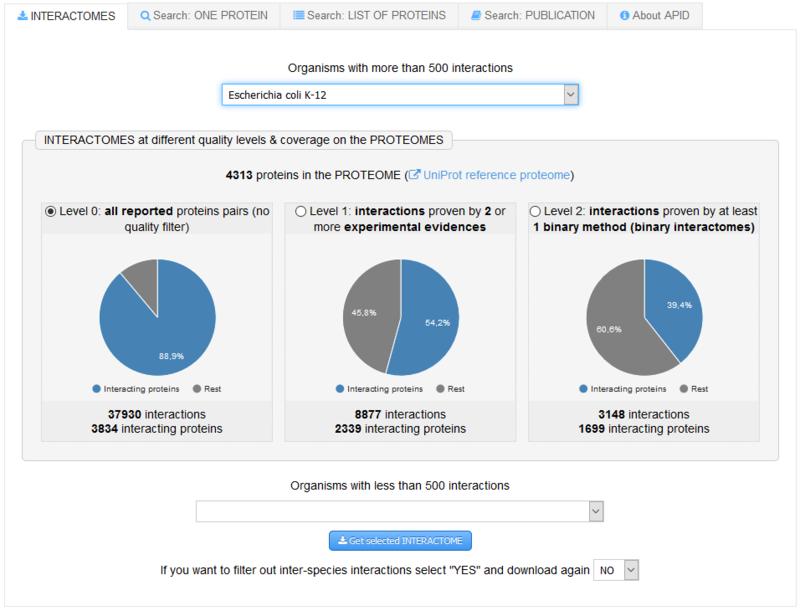 In the case of yeast (Saccharomyces cerevisiae), the number of proteins with reported interactions is larger than the UniProt proteome (http://www.uniprot.org/proteomes/UP000002311) because its interactome includes yeast putative proteins (coming from TrEMBL but not present in the UniProt reference proteome). We provide here to download all the raw curation events from protein-protein physical interactions that are integrated in APID coming from the unification of the primary public databases: BioGRID, DIP, HPRD, IntAct and MINT. The data are grouped in single files by organism, and they are provided in the HUPO-MI (http://www.psidev.info/groups/molecular-interactions) standard format called MITAB (PSI-MI TAB v2.5, that is a common tab delimited format for MI data interchange: https://code.google.com/archive/p/psimi/wikis/PsimiTabFormat.wiki). The raw curation events for any singular protein-protein interaction can be also downloaded in MITAB format within the APID web server. We will update the information on APID Interactomes Web Server every 3 months (considering that the integration and unification of the raw data from the primary databases of interactions includes at least a 5% change with respect to the previous data). Funding has been provided to Dr. J. 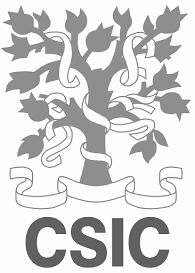 De Las Rivas group by the Local Government, "Junta de Castilla y Leon" (JCyL, Valladolid, Spain, grants number BIO/SA68/13) and the Spanish Government, "Ministerio de Economia y Competitividad" (MINECO, ISCiii, Madrid, Spain, grants number PI12/00624, PI15/00328 and AC14/00024).